In case you don’t want to look at the entire playlist screenshot, here’s a highlight for you. 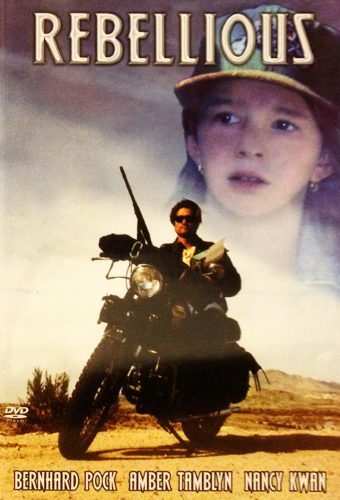 Since I technically started the BIYF Binge yesterday and the first post from that will happen within the next couple days, this will be the last “Pre-Binge” post and it will be brief. The master playlist is nearly complete. I’ve mocked up and inserted the one missing item in this screenshot and added signposts for the 6 “live action” events and the 2 “Zardoz has no reference material for this event” events (“The Tim Anderson Experience” Video [Excerpts] and the “Top Ten BIYF Moments” presentation). The list would take 6.9 days to run non-stop, end-to-end. 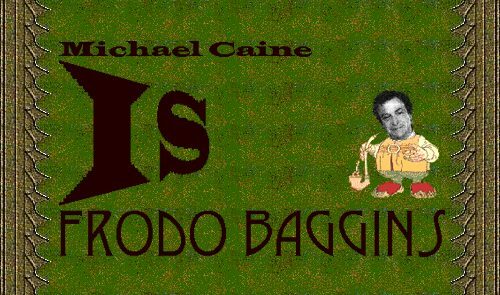 Click below to embiggen if you dare. 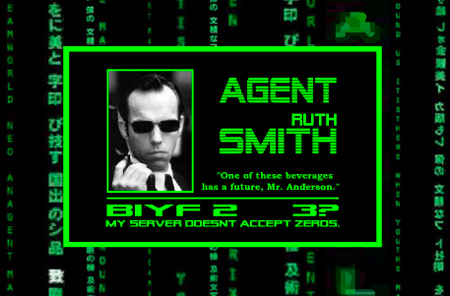 Things are quiet at BIYF.com these days. Thanks to some helpful vandals that facilitated “burning down the house” here, there are only a couple things live on the site at the moment. That’s actually OK with me. Not the vandals part, the quiet opportunity for a fresh start part. As I may have mentioned many times recently, we’re heading toward our 20th BIYF Festival in 2017. That seems like a good time to brush off the cobwebs, take a look around and decide what needs to stay and what can be relegated to backups-only status. Currently, everything is sitting out on the front lawn of the house due to the fire, so it’s mostly a matter of deciding what stuff to bring back into the new house as I build it. Here’s my thinking on that. Back when we started doing all this, there weren’t all of the options available to the general public for sharing content online that we have today. It was a lot more complicated, time-consuming, and (as amazing as it sounds) there was a lot less content out there. Or at least it seemed like it because it was harder to find and didn’t seek you out of its own accord as is increasingly common today. I wanted to have a place for us to celebrate us and this weird little ritual of ours that occurs once a year. As time went on this expanded to include a lot of the things that individuals or small groups of us did that I thought were delightful. Appearing on Jeopardy! The B-Squad! Hawkeye Tailgating! Rib Dependence! The Bricker’s new haircut! 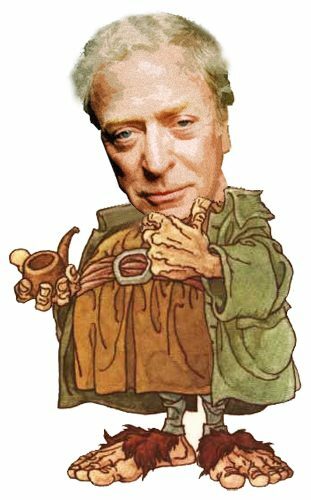 Michael Caine is Frodo Baggins! Things that made my world a happier place. Lordy, so much fun. You folks are amazing and it was fun to try and venerate that, at least in a small way. I heart you, Bricker. And your haircut. I’m going to try to reduce the scope of BIYF.com to being just about the BIYF Festival and things relating directly to that. Movies, beer, shared memories. That sort of thing. Maybe that way I can get it back on it’s feet and produce something that’s unique again. Something that’s worth revisiting from time to time. That’s still not a small task, but I’m looking at it as a long-term, multi-stage project. 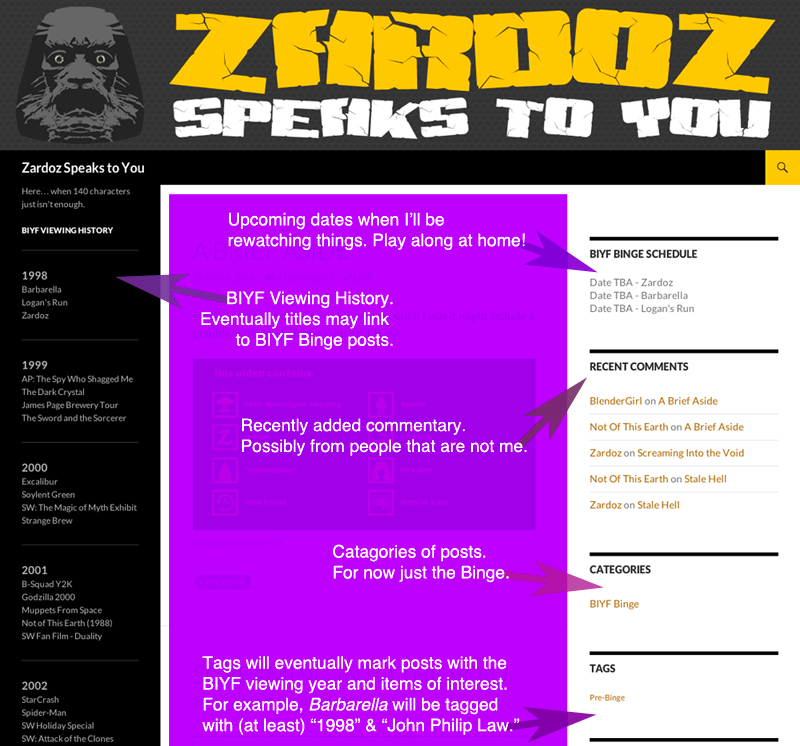 At the moment the only things active at the site are the home page, the “password-protected” landing page, and the Zardoz Speaks to You (Mark II) blog. If you’re still reading this post at this point, you already know the BIYF Binge is coming and will dominate the blog for (at least) the next year. My plan is to eventually gather up the Binge posts related to a given year, combine them with any other available relics from that same year’s BIYF Festival and assemble an online shrine for each year (“onshrine” them?). I also plan to use the blog to gather feedback not just about your BIYF viewing memories/recurring nightmares during the Binge, but also about your memories of the BIYF Festivals themselves. When I start building the shrines I’ll try to supply blog post prompts for each year as I go. Hopefully we can capture some more of our memories and stories in context before they completely fade into the past. 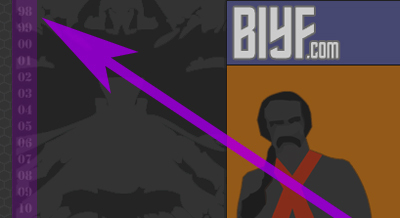 If you look along the left side of the landing page at BIYF.com, you’ll see a column of numbers beginning with “98.” This is where I’ll begin linking the shrine pages once they actually exist. There won’t be a lot else living here, but I hope we can make what is here fun to revisit from time to time. I look forward to seeing what happens over the next twelve months. I hope you are as well, but I’ll be satisfied with mild interest. It’s all about managing expectations. Drink beer! Relive movies vicariously through the blog without being forced to actually watch them again yourself! Comment below if the mood strikes you! Do you still love the Bricker’s haircut? I know I do. 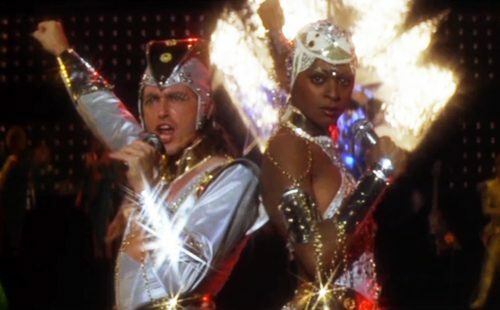 As per plans outlined in a previous post, I’ve been contemplating how our Friend (“My friend, your friend… everybody’s friend.”) can help me get through the impending marathon. On the plus side, we know there’s an abundance of new, geek-targeted, and really quite tasty beer out there so keeping an appropriately nerdy selection of these stocked in reserve at all times should be quite easy. 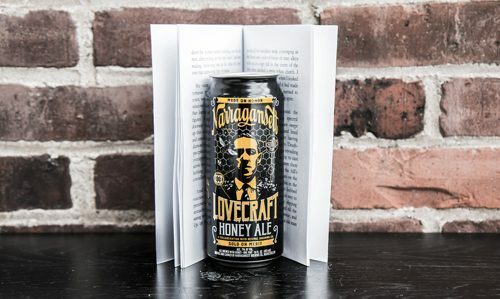 I feel like I should be wary of drinking something marketed under a “Lovecraft” banner. It seems destined to turn out… poorly. Plus, I feel like I’ve gotten a pretty good handle on selecting beer over the years. At least at selecting it for me. Not so much. Also, outside the scope of this experiment. Man, I haven’t really spent any substantial time with hard alcohol since college and back then it was not a relationship founded on quality. Which means I’ve had to do a little research because my “In Case of Dire Emergency Where One Beer Will Not Be Enough” plan involves mixing a drink using my as-yet-unopened Outer Space vodka. A single drink, to supplement the single beer per session if needed. It sounds so inadequate when I say it aloud. 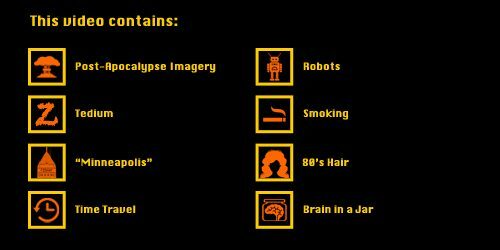 While this site has a lot of drinks based on video games, it also caters to a lot of generally geeky passions beyond that. The Drunken Moogle looks like it will provide me with a good starting point when needed. 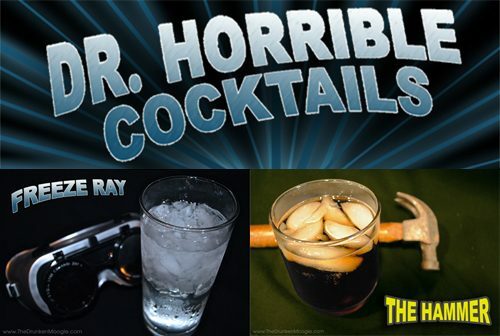 I can search by an ingredient (such as vodka) and there’s a decent selection of genre-inspired drinks to choose from. Based on a very brief search, I don’t think I’ll lack for other resources if this one eventually fails me. So many choices. I’m hoping I won’t have to resort mixing drinks too frequently anyway. I have to ration my supply and save it up for those really challenging slogs later in the marathon. After all, there’s only the one bottle of Outer Space vodka in the house and once it’s gone, it’s gone. It will not be refilled/replaced during the marathon. I’m thinking of it as an emergency health/mana potion. If you have any favorite vodka drinks that you think should be in my arsenal for this undertaking, please let me know in the comments section. And hurry! I’m running out of delaying tactics and may actually have to start watching things soon! I’ll bet our hacker didn’t look like this. Not even a little bit. Well, I was asking for help in delaying the start of the BIYF Binge and The Internet obliged. It was most likely a bot (and not a hot, yet scruffy-looking, Romulan/Vulcan-cosplay-esque “hacker”) that latched onto a vulnerability in an old, unused, and unupdated WordPress installation and uploaded a bunch of crap to the server. 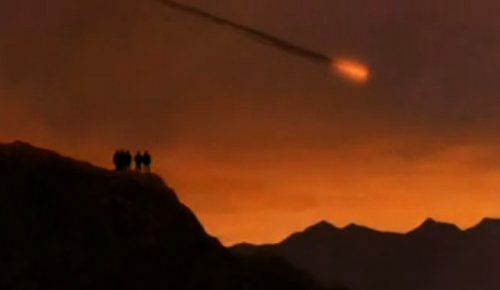 It may have been something else entirely, but either way it was invasive enough that I think nuking everything from orbit was the safest and easiest course of action. Really, it’s the only way to be sure. Plus, delay delay delay! Also, now I can slowly bring back old things and call them NEW again. 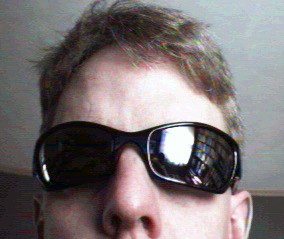 And I can post them behind the “member” login off the front page of BIYF.com as I bring them back to screen out search engines and nosy, but lazy, uninvited visitors. If you don’t remember the casual, not-highly-secure screener login to BIYF.com just let me know. Hey, hey, hey! BIM’s on the way! Through the mail from Spokane to Cedar Rapids. Hopefully I’ll have everything I need and know everything I need to know before Memorial Day Weekend, my tentative start date for the BIYF Binge. Your assistance is very much appreciated. As mentioned repeatedly in several different venues, all logins for the new blog have been created and sent out. As before, please feel free to change your passwords to your liking. Also, please remember that I’ll have to manually approve your first comment and then you should be able to post comments at will after that. It’s good to be back up and running and I’m actually looking forward to doing more stuff here. Honest and for true. I’m amazed I’ve managed to eek out as many posts “about” the BIYF Binge as I have without actually being forced to start the BIYF Binge. Here’s hoping I can keep my streak going and stall for a bit longer! Addendum (5/11/16): I just noticed the bit pictured to the right doesn’t show up for me when I’m logged in (as I was for the screenshot above). Since it’s not pictured there, I’ll point it out here. 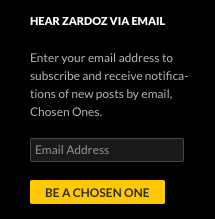 Normally, this is found in the upper part of the left column (above the BIYF Viewing History) and it provides a way to sign up and be notified by email when new stuff is posted here. This may or may not be of interest to you. I’m curious what it looks like for you guys when you’re logged in, but not so curious that I can be bothered to log in as one of you and look. I just wanted you to know it exists. Well, I’ve nearly made it to the Abyss and I’m prepared for a lot of screaming once I take the plunge. Fortunately, there’s still a bit of delaying to be had. Some of it isn’t even of my doing! But most of it is. I’ve connected with Rollerballer and I think we’ve got a plan worked out to get me the items I need from him. There’ll be a short delay on this, but I believe I’ll have them before long. I’ve poked the bear (or guy-in-a-bear-suit?) a couple times regarding the two viewing items that I’m not sure still exist in any form. No responses yet, but I’ll keep poking until I find out more or it wakes up and mauls me. Either is acceptable. My money is on “I’m waiting for information about this topic” being the best delaying tactic available to my arsenal. Don’t let me down! I’m pretty sure there’s zero Shatner in this. This is no doubt written by an impartial third party with no attachment to the production team. 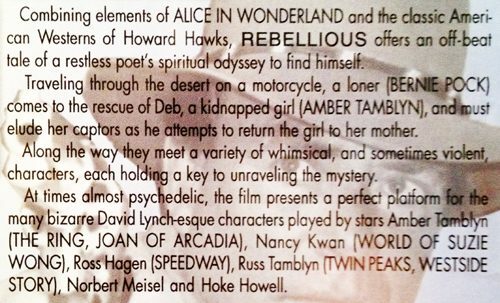 A brief scan of the film (not actually watching it) suggests that invoking things like “Alice in Wonderland,” Howard Hawks, psychedelic, and David Lynch in the description may be overselling things a bit. Quite a bit. Overall no-harm-no-foul, but in the end I still need a copy of the basic, no-frills edition of “Free Enterprise.” It has been re-ordered from a different used-video supplier and should arrive in a few days. 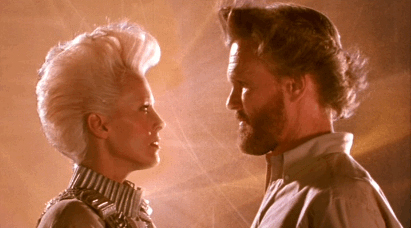 The only other news from this week is that I tried out my note-taking sheet by reviewing 1989’s “Millennium” starring Kris Kristofferson and Cheryl Ladd. While I don’t think I’ll actually bother writing up a review for this (there’ll be plenty of that sort of thing headed my way), I am fairly confident I would have enough material from my notes to do so. I’ll probably try it out one more time (“Pathfinder” 2007, starring Karl Urban, Clancy Brown, and Moon Bloodgood perhaps?) before I finally get things started. If you have any thoughts on any of this, have any materials/know anything about the Tim Anderson Experience video or BIYF Top Ten List, would really like us to watch “Rebellious” at an upcoming BIYF Festival, or think I’m being lazy and should write a review for “Millennium” and/or “Pathfinder,” just let me know in the comments below. I’ll keep knocking out a post a week here until the BIYF Binge actually begins and everything goes to hell.